The Washington Post wants to make sure you know exactly where to be next time the game goes nine hours or more. What stadium currently offers the greatest selection of craft beers on tap in Major League Baseball? Beer nerds probably already know the answer to this one. That would be Safeco Field, home to the Seattle Mariners. According to the Washington Post’s delicious research, approximately 70 percent of the stadium’s 700 (!) beer handles tap “good, quality craft beer”—that’s a direct quote from Steve Dominguez, general manager of Centerplate’s food service operations at Safeco Field. Not surprising to anyone who’s spent time in Seattle, those craft beers dwarf mass-market beers in sales by a ratio of nearly four to one. If that’s not enough to make you want to plan your Pacific Northwest baseball road trip now, Safeco Field apparently purchased three cask engines earlier this year so it can offer cask-conditioned ales to its customers. Not only that, but the stadium also offers 22-ounce bombers from a raft of local breweries including Pyramid, No-Li, and Rogue. It’s enough to make even resolute non-baseball fans suddenly want to go out to the ball game. 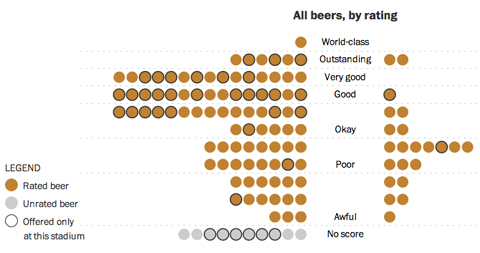 The Washington Post used ratings from user-generated beer enthusiast site BeerAdvocate to rate beers at MLB stadiums. Safeco Field isn’t the only MLB stop for craft beer lovers, though. Cincinatti’s Great American Ballpark comes in second, according to WaPo’s handy tool. The reason: it features the fairly new Reds Brewery District, which is an 84-foot long bar with over 50 taps. Of those taps, more than 20 are devoted to craft beers both local and national, including MadTree, Founders, Bell’s, and Great Lakes. But that’s not all. WaPo’s research found that Cincinnati Reds fans—and other visitors to the ballpark—could choose from more than 130 distinct beers, once single-day offerings were taken into account. That’s the most in Major League Baseball, period—even more than Safeco Field. This happened even though Bud Light is still the Brewery District’s biggest seller. What this means is that craft beers are not drawing Big Beer drinkers away from their favored brews. Instead, they’re drawing more beer drinkers into concession stands, resulting in a higher volume of beer sales in general. Cubs fans still can’t drown their sorrows (and moan about that damned curse) in a lot of highly rated beers, though—unless they go on a road trip to an away game. Still, at least Cubs fans can feel superior to the Yankees in at least one legit way. 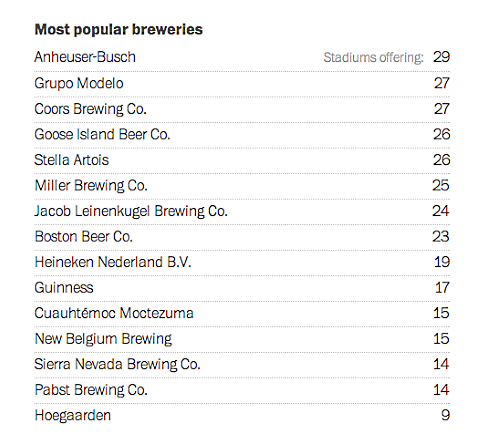 According to WaPo, apparently the Yankees currently have the worst MLB beer list of all.